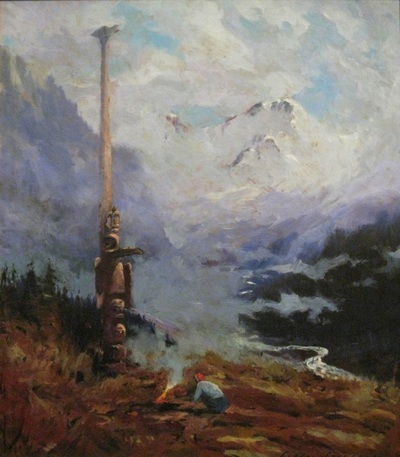 A painter and illustrator specializing in Indians and landscapes of Alaska, Sydney Laurence was born in Brooklyn in 1865 and died in Anchorage in 1940. In between he led a full and adventurous life in which his art was a constant. Like some fictional character, as a teenage boy Laurence ran off to sea, was shipwrecked and saved the captain's life. He returned home to a more placid life in New York where he began studies at the National Academy of Design with Edward Moran. This was followed by a move to Paris in 1889 and further studies at the Ecole des Beaux-Arts. He achieved success in Paris, receiving an honorable mention at the Salon Artistes Francais in 1894. That same year he moved to the art colony at St. Ives in Cornwall, England, where he continued to paint on and off for the next thirteen years. During this time, however, Laurence also became a war correspondent for various U.S. And British journals, traveling to Africa where he lost his hearing covering the Zulu war; getting wounded during the Boer War; and traveling to China, apparently without incident! After returning to England in 1903, Laurence's thirst for adventure took him to Alaska, where he searched for gold in Valdez from 1904-1912. Unsuccessful in his quest, he returned to painting in 1912. 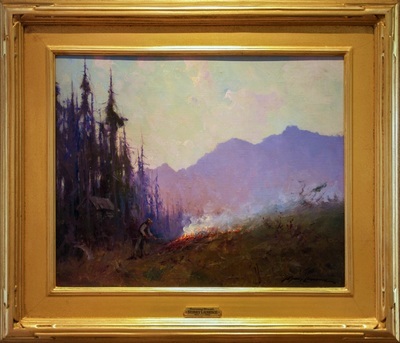 In the interim, in 1908, he spent time in the Pacific Northwest, helping to establish the Western Academy of Beaux Arts in Seattle. This arts and crafts school later moved to the town of Bellevue and became a short-lived art colony. Art was to become Laurence's most successful endeavor for he is now considered perhaps Alaska's most famous painter, whose many works are on display in Anchorage. He is particularly known for his numerous depictions of Mt. McKinley. It was while in Valdez that Laurence heard about Mt. McKinley, so he journeyed there by steamer and dogsled. So impressed was he with the mountain that by the summer of 1913 he had produced 40 oil sketches. By 1914 he had finished an eight foot canvas entitled "Top of the Continent", which was his first finished view of Mt. McKinley, and has become one of his most famous. Laurence continued to paint, but also opened a photography shop in Valdez to support himself. 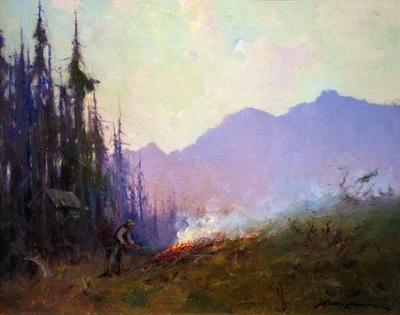 He later moved to the newly developing town of Anchorage and started a studio there; a fortuitous move as it increased his growing reputation. While he frequently returned to his cabin in Alaska to paint, he spent the last eighteen winters of his life in Los Angeles where the days were longer and the light was better.